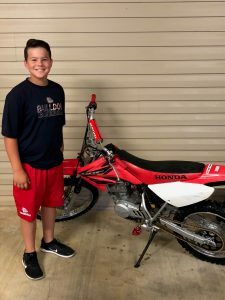 Ouachita Parish Sheriff’s Deputies received a report of a stolen Honda dirt bike from a residence in West Monroe on March 27, 2018. At the time the theft was reported, the complainant advised his young son had worked and recently bought the bike with his own money and was taking the loss very hard. The investigation into recent thefts led to the recovery of the dirt bike by OPSO Investigators. The bike has been returned to the owner. Shown below is the happy youngster with his Honda dirt bike back in his possession. We are fortunate to be able to serve the residents of Ouachita Parish and appreciate the support of the Deputies of the Ouachita Parish Sheriff’s Office.